Dedicated to whom demands the best, Crancy Fresh Cat is a complete, tasty and balanced medium energy food for sterilized cats. 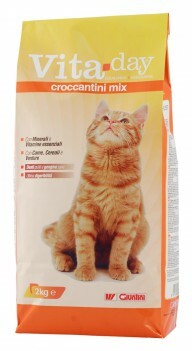 The recipe of Crancy Fresh Cat, with fresh chicken and turkey, has been formulated and developed by veterinary nutritionists to satisfy all the nutritional requirements of a sterilized cat. 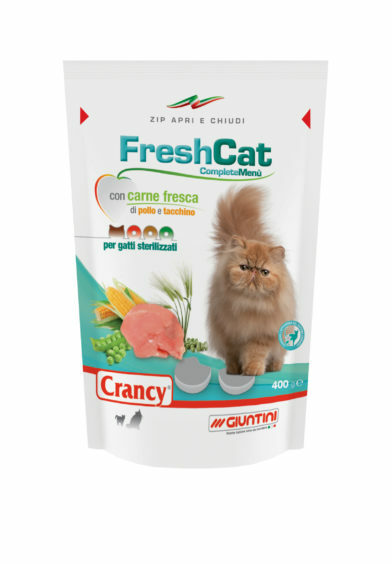 Crancy Fresh Cat is rich in high quality protein, it contains flaxseed which helps the digestion and it is supplemented with methionine to help preserve his renal system and to support the prevention of struvite kidney stones. A right balance of protein, fat and fiber is targeted to weight control. Cereals, Meat and animal derivatives (fresh Chicken and turkey meat 6% in “cat” shape croquettes), Vegetable protein extracts, Derivatives of vegetable origin, Seeds, Vegetables, Oils and fats, Minerals. Crude protein: 31%; Crude oils and fats: 10%; Crude fibres: 2,9%; Crude ash: 8%; Sodium: 0,3%; Methionine: 0,6%. Vitamin A: 20.000 U.I./kg; Vitamin D3: 1.000 U.I./kg; Vitamin E: 100 mg/kg; E2 Iodine: 0,5 mg/kg; E6 Zinc: 12 mg/kg. Hygiene plus is the daily solution for the hygiene and freshness of cat litter. With antibacterial sanitizer and Odor Stop.